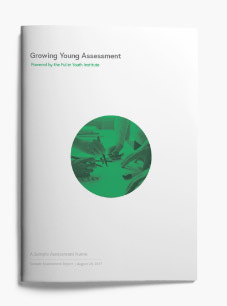 The Team Growing Young Assessment leverages the research done in the Growing Young project to determine six scales by which to measure your church. When you take the Team Assessment, you and your team members participate in a survey for immediate results detailing your churchs strongest and weakest areas according to Growing Young research. A 30-page report will integrate your responses into graphs of aggregate results, provided immediately upon completion. The report will also highlight next steps according to your results. Below, select the number of team members who will be taking the assessment. Leadership team greater than 30? Contact FYI.